This paper aims at determining of inorganic leachate contamination for a capped unsanitary landfill in the absence of hydrogeological data. The 2D geoelectrical resistivity imaging, soil physicochemical characterization, and surface water analysis were used to determine contamination load and extent of selective heavy metal contamination underneath the landfill. The positions of the contaminated subsoil and groundwater were successfully delineated in terms of low resistivity leachate plumes of <10 Ωm. Leachate migration towards the reach of Kelang River could be clearly identified from the resistivity results and elevated concentrations of Fe in the river downslope toe of the site. Concentration of Fe, Mn, Ca, Na, K, Mg, Cu, Cr, Co, Ni, Zn, and Pb was measured for the subsoil samples collected at the downslope (BKD), upslope (BKU), and the soil-waste interface (BKI), of the landfill. The concentration levels obtained for most of the analyzed heavy metals significantly exceed the normal range in typical municipal solid waste landfill sites. The measured heavy metal contamination load in the subsoil is in the following order Fe ≫ Mn > Zn > Pb > Cr > Cu. Taking into consideration poor physical and chemical characteristics of the local soil, these metals first seem to be attenuated naturally at near surface then remobilize unavoidably due to the soil acidic environment (pH 4.2-6.18) which in turn, may allow an easy washing of these metals in contact with the shallow groundwater table during the periodic fluctuation of the Kelang River. These heavy metals are believed to have originated from hazardous industrial waste that might have been illegally dumped at the site. This work was sponsored by Ministry of Sciences, Technology and Environment of Malaysia under IRPA Grant No. 08-02-02-EA178. 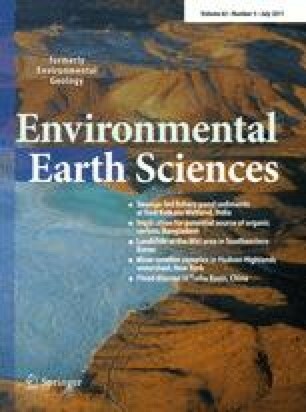 Authors are grateful to the research fellow at the Department of Geology, University of Malaya, Emeritus Professor Dr. Charles S. Hutchison for his critical and valuable review of this paper.